The hGHR belongs to the hematopoietic receptor superfamily (1); other members of this family include the receptors for prolactin, interleukins-2, -3, -4, -6, and -7, granulo-cyte-macrophage colony-stimulating factor, erythropoietin, thrombopoietin, and interferons-a, and -y. Receptor members of this superfamily generally contain a rather large extracellular domain (about 200-400 amino acids), a single transmembrane helix, and an intracellular domain. Even though little overall sequence similarity exists between members of the family, there is very strong conservation of secondary structural elements in an extracellular domain commonly referred to as the cytokine receptor homology (CRH) domain (1). The extracellular part of many of the cytokine receptors contains two CRH domains and other domains of similar topography. However, the extracellular region of the hGHR receptor consists of only a single CRH domain. 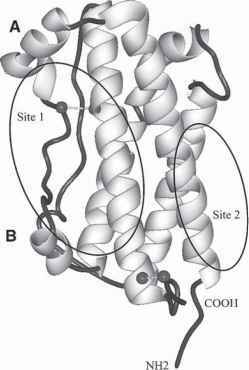 The nonmembrane anchored hGH-binding protein (hGHbp), which occurs naturally in serum, can be isolated (9). This soluble protein consists of the entire extracellular region and binds to hGH with an affinity nearly identical to that of the full-length receptor expressed on cells (10,11). Fig. 1. Ribbon diagram of the structure of hGH. The coordinates used for making this model were taken from ref. 1. Each of the four helices are labeled. The helices are arranged with an up-up-down-down topology and the two long loops between helices 1-2 and 3-4 are labeled. Two of the three minihelical segments are labeled as minihelices (A) and (B). Cysteine residues C53, C165, C182, and C189 are shown as spheres. antiparallel p-strands that are organized to make two sheets; one sheet consists of three strands and the other sheet contains four strands. The two sheets are arranged to make a P-sandwich. The middle of the sandwich is made of mostly hydrophobic residues that are weakly conserved among other superfamily members. The N-terminal domain of the hGHR contains three cysteine bridges (C38-C48, C83-C94, C108-C122), which are buried between the two P-sheets. The C-terminal domain of the hGHR contains no disulfide bonds. The two domains are connected by a short four-residue linker segment. Although the structure of the free hGH receptor is unknown, the structures of several ligand-receptor complexes show that the receptor has few intradomain contacts (7,12) (M. Ultsch and A. M. de Vos, unpublished results). In these complexes the two fibronectin type III domains are oriented in space approximately perpendicular to one another. This arrangement displays the loops connecting the P-strands to bind hGH in the complex; residues throughout six of these loops govern most of the hormone binding. Fig. 2. Ribbon diagram of the structure of the extracellular domain of hGHR. The model is based on X-ray coordinates from ref. 1. The location of the consensus sequence YDEFS (WSXWS box) is indicated with an arrow. Cysteines in the N-terminal fibronectin type III domain (C38-C48, C83-C94, C108-C122) are shown as spheres. 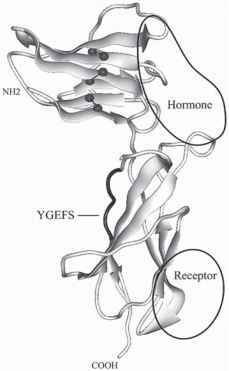 region, most receptors in this family contain a stretch of amino acids (WXSWS) that may possibly play a structural role. For the hGHR, this sequence is YDEFS and the crystal structure of the hGH-hGHR complex shows that these side-chains are not likely to have an important role in ligand binding (1). The precise functional importance of the WSXWS box remains somewhat of a controversy. In general, all of these conserved residues are likely to be important for maintaining the structural arrangement and global fold of the hGHR (and other receptors in the family), whereas the less conserved loop segments between the P-strands are mostly involved in determining ligand-binding specificity.